Fifty-four youngsters aged between two and four have helped to raise more than £400 for our Doncaster hospice. The little ones who attend Rossington Early Learners at the Holmescarr Centre, took part in a sponsored obstacle course and ‘splat your teacher’ week-long event, raising £415. 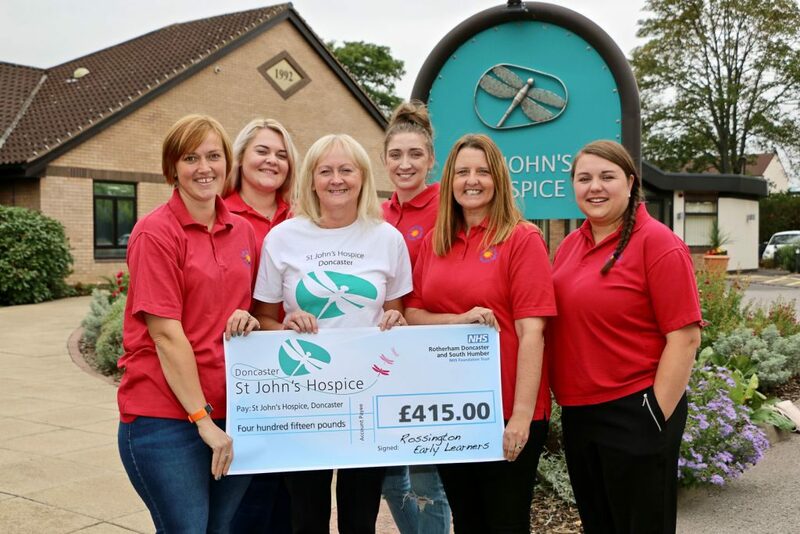 The fund-raising was organised by a team of staff from the Early Learners, including Dawn Wallace, whose grandma Doris died at our St John’s Hospice, Balby. Dawn’s sister Marie has also raised and separately handed over a further £2,000 after organising a party and raffle in aid of the hospice. Staff from the Rossington Early Learners are pictured handing over their cheque to Lindsey Richards (centre) of St John’s Hospice.